Skips Originals is dedicated to providing exciting, innovative, tackle solutions for fly fishing anglers. SKIP'S ORIGINALS offers unique, high quality fly fishing products, including TOSI Strike Indicators for Nymphing. Founded in 1990 by Skip Halterman as an off-shoot of his White River School of Fly Fishing in Eureka Springs, Arkansas he instructed his students on the banks of the famous White River chain of tail waters and a tributary, The Little Red River, which held the world record for brown trout at 40 lbs. 4 oz. for over 10 years. Skip realized that as good as the sport of fly fishing was, there were many long-standing, fly fishing and tackle problems and limitations. He began to use the knowledge he'd gained from his life-long and extensive fishing experience to develop better products. Then came the Turn-On Strike Indicators, a major renovation in strike indicators that took the industry by storm in 1991. They have been copied but never equalled. 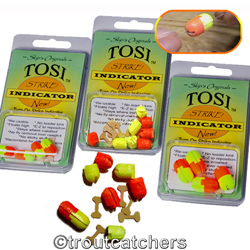 Skips Turn-on Strike Indicators - TOSI - Reusable, Reliable, Convenient. Skips Turn-on Strike Indicators, in packs of 4, in 3 sizes Small, Medium and Large.